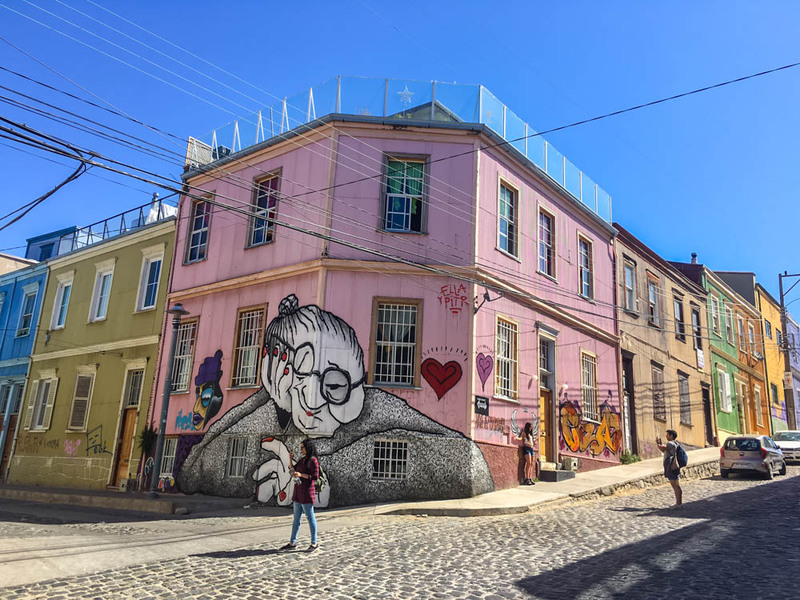 Brilliantly colored buildings, breathtaking lookouts, old funiculars and some of South America’s finest street art all pouring down steep hills towards a busy sea port and a secluded natural harbour. 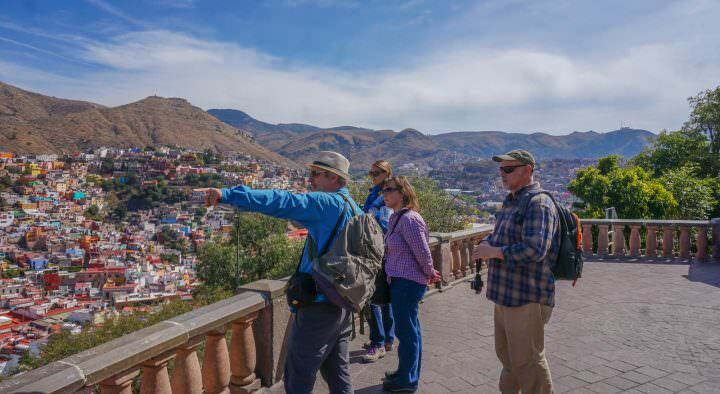 When we heard this description of Valparaiso, we knew we had to go. It even has a cool nickname: “Valpo“. At this point we’d been travelling around Argentina, Uruguay and Santiago for nearly 2 months without stopping. 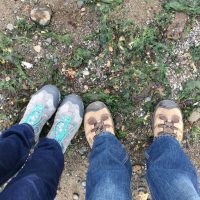 As backpackers, this would be totally fine, but as digital nomads and travel bloggers, we had a lot of work to catch up on! 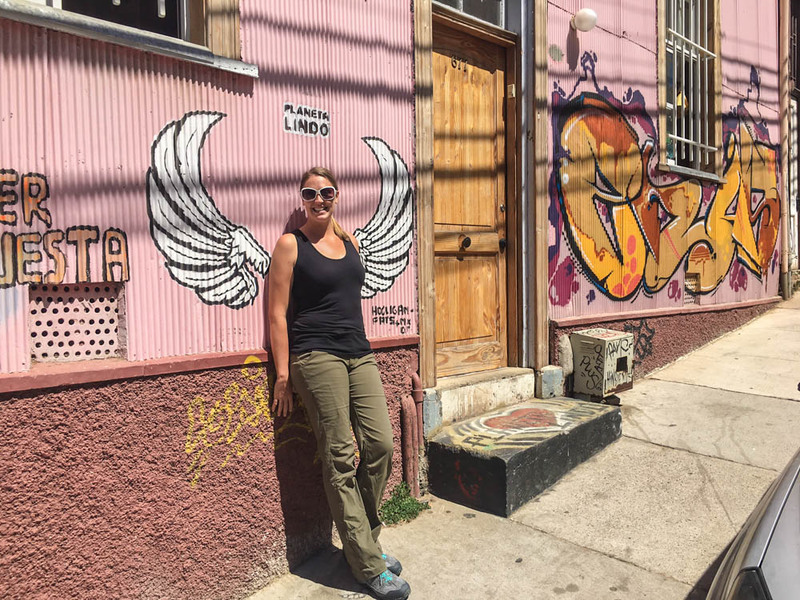 So, after swirling, sniffing and sipping our way around Mendoza, followed by a visit to Chile’s capital of Santiago, we made a beeline to Valparaiso. The great thing about this job and this lifestyle is that we can just stop anywhere around the world for a few weeks and get caught up. 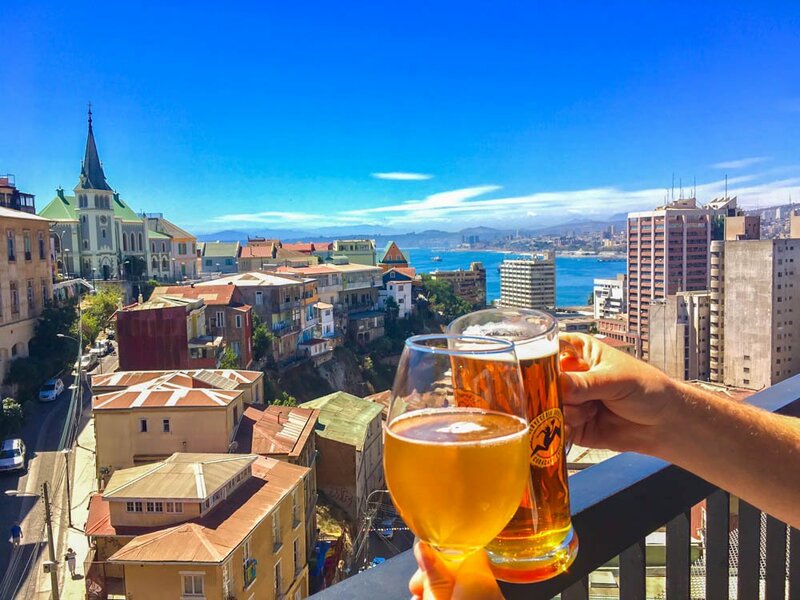 When people told us about Valparaiso, we figured it would make the perfect base to get an apartment and hangout for a bit, while spending a few hours on the computer each morning. It turned out that we immediately fell under the spell of this colorful and cheery, yet edgy and mischievous port town, and even after 3 weeks, we weren’t quite ready to leave. 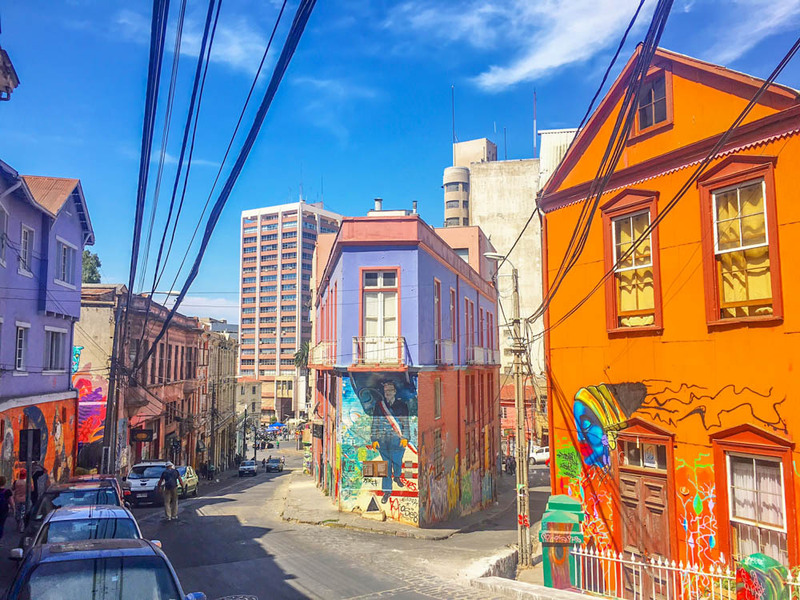 The busy port town of Valparaiso has long been a favourite hangout spot for artists, painters, philosophers, poets and now… travel bloggers (well, us at least). The town seems to be clumsily piled on top of itself with no real rhyme or reason to the labyrinth of narrow streets. Valpo is known as the San Fransisco of South America. It’s a technicolor blanket of somewhat dilapidated buildings, haphazardly laid over a couple dozen cerros (hills) creating a chaotic cluster of residential mayhem that somehow works beautifully. On weekends, the place feels a bit like a bomb went off after the nightlife of the city has exploded on the streets and there is garbage and grime everywhere. But every Monday morning, the street cleaners are back at it and they somehow dress up hung over Valparaiso to get her ready for another week of work. The city is clean and dirty at the same time. In some places the street art is more like vandalism, but for the most part, the brilliantly painted murals could be placed in any gallery and stand up next to the best traditional artwork. 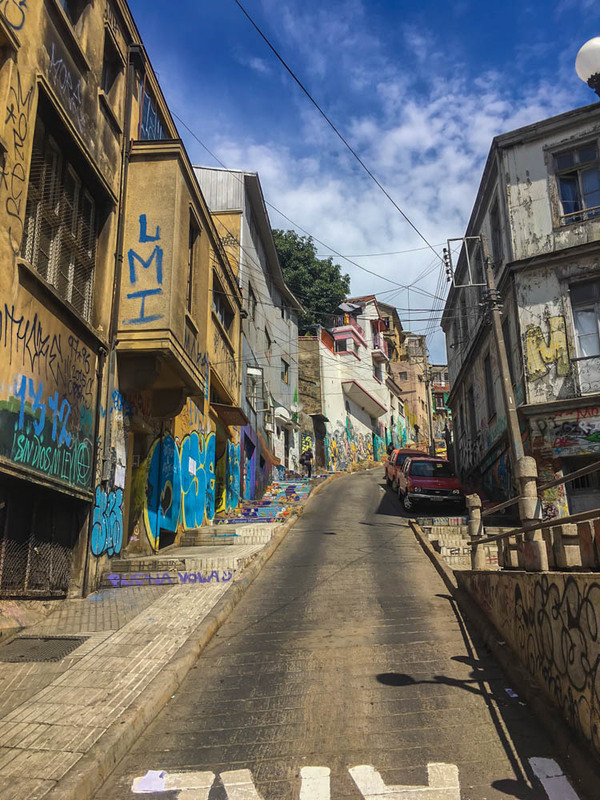 No matter where you go in Valparaiso, you’re going up or down a steep hill. This is the nature of the town, but it’s part of what makes it so unique. There are mirradors (look outs) and every turn and the unique architectural style feels very much like a fishing village that you may find on stilts over a quiet sea bay. Small parks with limited greenspace do break up the largest clusters of buildings and while there is no way to tell where each sinuous street will start or end, it’s pretty hard to get lost here. The city is the perfect size and has enough to keep even a fast-moving traveller busy for a few nights. We decided to head to AirBnB to find a nice apartment in the city for a few weeks. Because our 3 week “working holiday” in Valpariaso was a last-minute decision, we didn’t have enough time to use a better way to find an apartment. Our place was absolutely beautiful. It was a small one-bedroom flat set on a hill high above the bay below. The entire front-facing side of the place had floor to ceiling windows, both in the living room and the bedroom. We actually found it hard to leave our apartment because the view was so spectacular. We would sit there with our massive sliding windows open and our feet up on reclining chairs, coffee in hand, watching as the fog lifted from busy bay below. Massive cargo boats and cruise ships would emerge in the morning light, slowly putting in and out of the commercial port. Our office had an equally stunning view. It was hard to keep our eyes on the computer when we were constantly looking up in awe at the colorful hills spilling into the sparkling bay some 300 meters below us. 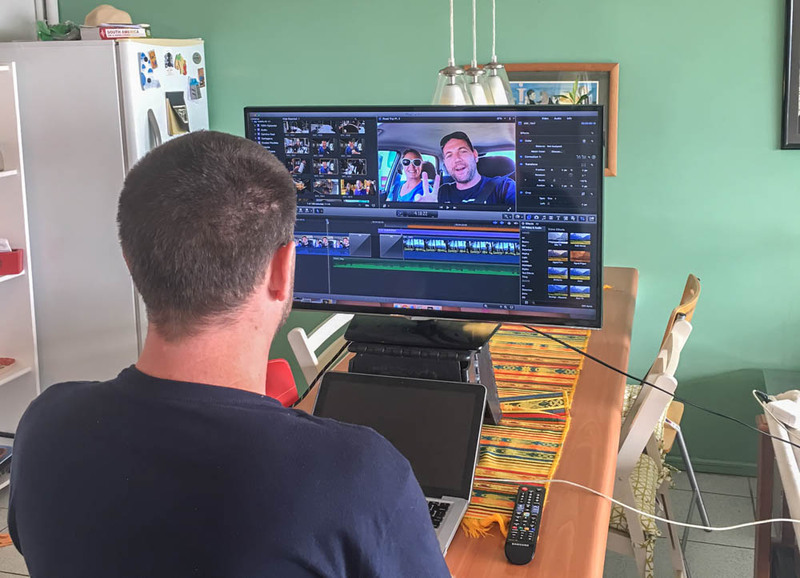 Each morning we spent about 4 hours working on the blog and business, and then we would either head out and explore, or simply gaze out the windows some more. Aside from passing time looking at our view, we did manage to get out and explore the town a bit. When we stop for a “work holiday” like this, we don’t really prioritize the touristy sights in town, but we still like to get out and spend as much time off the computers as possible. In Valparaiso, there were quite a few activities to pass the time. Probably our favourite little excursion was walking down to the seaside promenade and then following it east for about 2 kilometers. Here there was a random cement ruin sitting about 10 meters (30 feet) off shore. 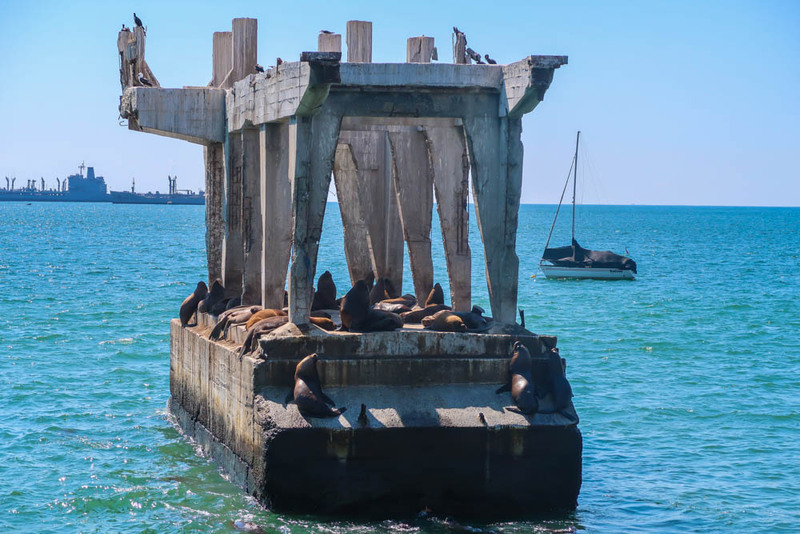 The somewhat sun sheltered structure provides the perfect place for a group of grumpy, territorial sea lions to fight each other and sunbathe in equal measure during the late afternoon. Ourselves (along with about 20 other tourists and locals), hung out on the rocks on the shore watching these aggressive beasts snort, snarl and snap at each other while trying to lock down the perfect chill spot. The sea lions had a pretty hard entry to their little concrete retreat as they had to jump about 6 feet out of the water to pull themselves up onto the lowest platform. The hardest part for them was battling the already landed sea lions, who seemed to think that the platform was full, even though there was ample room for all of them. When they weren’t sleeping on their backs and itching themselves, the massive mammals would push each other off the edge of the platform and attack one another viciously. Needless to say this ongoing ritual of slumber and skirmish provided us and the other onlookers with great entertainment. There are a few funiculars around the town of Valparaiso that are not only a cool experience, but they’re also very functional for locals and tourists alike. Your legs will definitely get tired walking around Valpo, so the quick 300 peso (50 cent) ride up the hill can be a lifesaver. At one time there were over 26 funiculars around the town, but when we were there in February of 2017, there were just 6 of them still working, the oldest of which was built in 1883. The maze of streets that criss-cross the city make Valpo the perfect place to “get lost”. As I mentioned earlier, you can’t easily lose your place here because you can always just descend down the hill and be on the main Errázuriz street that runs along the harbour. Our favourite neighbourhoods and hills (cerros) to explore were Cerro Bellavista, Cerro Alegre, Cerro San Fransico, Cerro San Juan de Dios and Cerro Concepción. 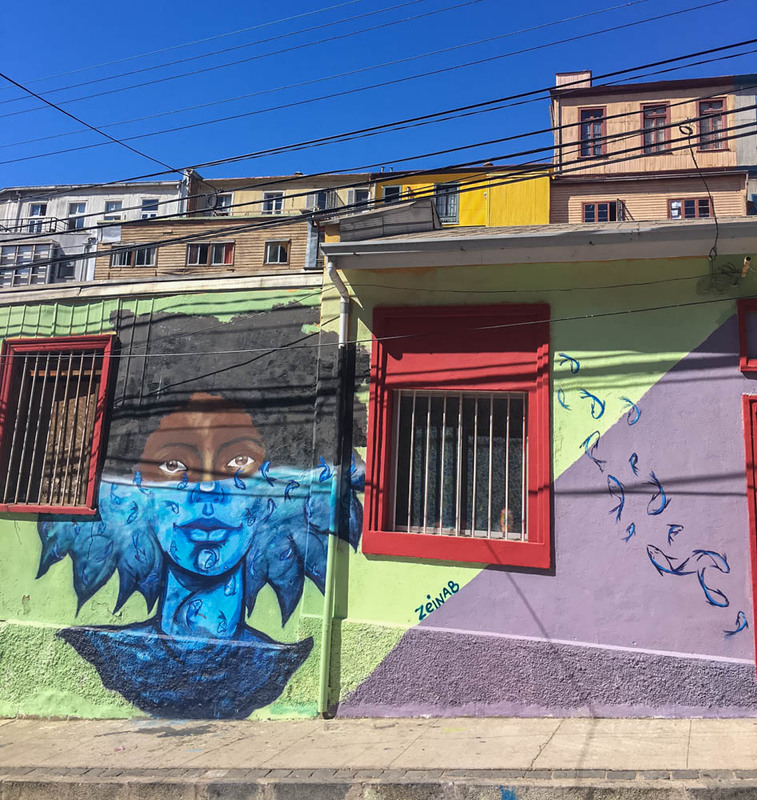 If Valparaiso is the cool kid with colorful tatoos in all the right places, then Viña del Mar is like her boring, conservatively-dressed step sister who can’t seem to make any friends. 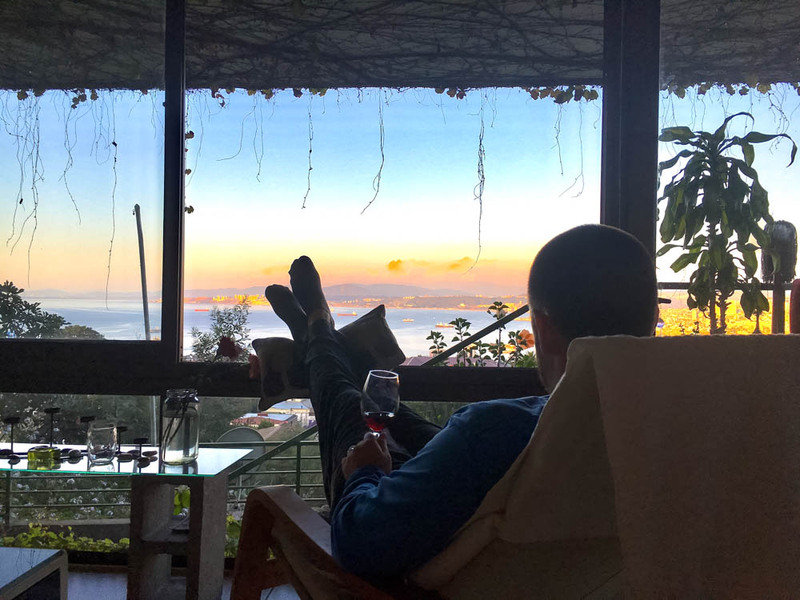 Just a quick 20 minute bus ride or 15 minute subway ride from Valparaiso, the contrastingly prim and proper Viña del Mar makes for an okay day trip, if only to get some wine and eat at international restaurants that Valpo doesn’t have (like good sushi). The city itself isn’t really noteworthy. A perfect grid of metropolitan buildings with large malls, a few nice parks and some decent amenities. Viña was the place where we took Dariece to see a physiotherapist for her back and where we picked up quality wines at the Vinoteca Wine Shop. 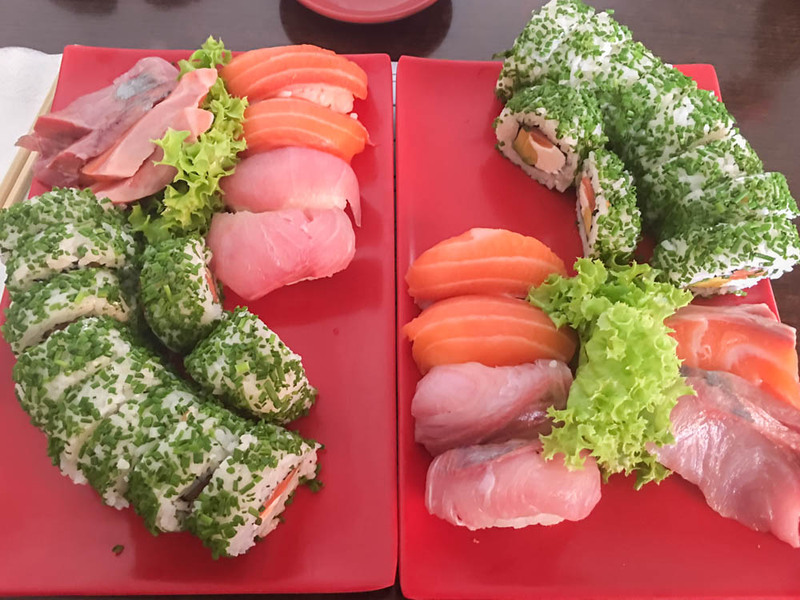 I also ate at a delicious and affordable sushi restaurant a couple of times called Sushi Home, but other than that, there wasn’t much reason to visit mundane Viña del Mar. Given the topography of the town, it’s no surprise that there are a lot of bars, restaurants and cafes with breathtaking views. Our favourite spot was Fauna Restaurant which is just at the top of the Ascensor Reina Victoria funicular in Cerro Alegre, with a deck hanging over the cliff looking towards Cerro Concepción, Cerro Panteón and the harbour. There were some pretty funky wine bars and pubs around the lower levels of Valparaiso. We spent a night hanging out with our friends AJ and Thalida from BatteredBackpacks.com and had a blast! We checked out a cool wine bar called Altamira that had great Syrah’s for $20 / bottle and tasty Pisco Sours (the national cocktail of Chile) for around $5 each. From there we headed to a little hole in the wall place that only sold alcohol (no food) called Ilícito Bar. There were a ton more funky bars that we could have pub crawled to, but we were here to work and chill, not get wasted and be hungover every day! There are many funky restaurants and bars all around town. Some have beautiful views over the harbour and some just serve up great food. Here are some of our favourites. If you’re wanting to go out for a nice meal, we really recommend Tenta Sandwich Gormet Restaurant which – yes – has gourmet sandwiches, but also delicious seafood meals and tasty salads. They also make a pretty mean lemonade with mint and ginger. Head to Sushi Home in Viña del Mar if you’re craving pescado of the raw variety. For drinking, we liked Cervecería Altamira and Ilícito Bar which are pretty much side-by-side near the Ascensor Reina Victoria funicular. At the top of that same funicular is the Fauna Valparaiso restaurant and bar. This place has our favourite views, but the prices are a bit higher than some other places in town. Because we had our own apartment, we ended up cooking for ourselves quite a bit. If you stay at a hostel, apartment or hotel that allows you to use the kitchen, the Jumbo is just east of town and had an excellent selection of food, very similar to what you’d find in a large supermarket at home. You really can’t beat the smooth, tasty gelado at Emporio La Rosa ice cream shop at the bottom of Cerro Cordillera on Condell Street. It’s still worth the trip to go to Vinoteca in Viña del Mar if you really want proper wines, but there are some, slightly better than grocery store bottles, at Mr. Drunk just of of Blanco & Uriolla street. Indeed, this city does have a reputation for some crime, but that’s mostly higher up in the cerros than most tourists go. Be mindful of your valuables and don’t walk down dark alleys at night by yourself and you should be fine. We stayed here for 3 weeks and although at first we were overly careful with our iPhone (tucking it away in secret pockets), after a while we started to feel more comfortable (but still not irresponsible). Many people have nice cameras out taking photos of street art and viewpoints and that’s totally fine during the day. It’s probably best to leave your valuables at home at night and instead of walking long distances, just hop in a taxi, collectivo or an Uber which are all very affordable in the city. It was fairly easy to make our way around the city. The best way is to walk and pretty much everything is within walking distance, but eventually going up and down the hills gets tiring. Luckily there are some other options. The buses in Valpo are quite reliable, somewhat comfortable and can take you pretty much anywhere in town. We never waited more than a few minutes for a ride. Google Maps includes public transport for Valparaiso in the app so you can find out which buses you can take and how often they come. Just search for directions to your destination and click the bus icon to show public transport routes. Bus prices vary depending on where you’re going but they’re usually around 300 pesos (50 cents). Shared taxis or collectivos are available on pretty much every street. Their prices are usually around 400 pesos (80 cents) and they show where they’re going on the front window. They also have numbers so once you get to know the collectivos that pass by your area, you can pick them up from pretty much anywhere in town. Another, more expensive option, is the taxi service. They are yellow and green and you’ll never be too far from one. If there isn’t a meter, make sure you know the price before getting in. Google Maps App can help to make sure the driver doesn’t take you on “the scenic route”. Love it or hate it, Uber provides a safe and easy to use service for travellers. 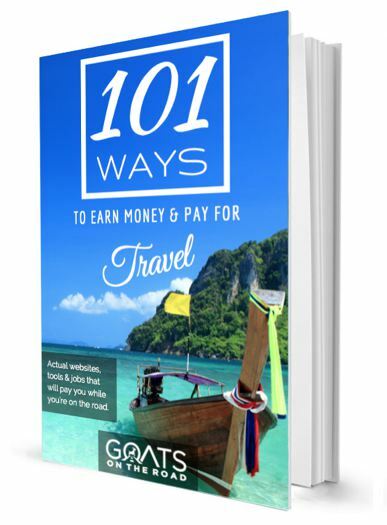 You don’t have to bother bargaining with taxi drivers who may rip you off, and a cash free transaction keeps your wallet safely in your pocket. There are plenty of Uber drivers in Valparaiso and we never waited more than 5 minutes, or spent more than $5 on a ride. The metro train rides along the cost all the way to Viña del Mar. There aren’t too many handy stops in Valpo town itself, but it’s a great way to get to Viña and back if you need to. Most people will come and go from Santiago. There are a ton of buses going both ways and you don’t really have to buy tickets in advance going in either direction. Just head to the bus station, tell them where you’re going and you shouldn’t have to wait more than a half hour for the next bus. Lots of companies do this route, it takes around 2 hours and costs about 7,000 CLP ($10.50) for a comfortable bus. In Santiago you’ll have to go to the Alemeda Terminal and there’s only one bus terminal in Valpo. We loved Valpo! This was one of the more unique places we have ever visited and it really grew on us over time. Part of our love affair was with our apartment and the beautiful views over the bay, but we also loved the vibrant colors and matching energy of the city. The street art was fantastic, there was good food, fun bars and lots to see and do. If we had better wi-fi at our apartment, we probably would have considered this place as a more permanent digital nomad base. But our 3 weeks was just enough time and after finishing up in Valpo, we were excited to fly down to Punta Arenas where we planned to meet our friends Jazza & Alesha to go hiking in the famous Torres del Paine National Park in Patagonia. Stay tuned for more from Chile! 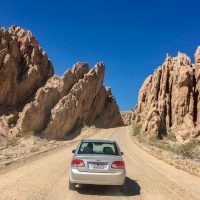 Never imagined adding Valparaiso to my travel bucket list, but there it is now, after reading your post. Glad to hear it Carl! 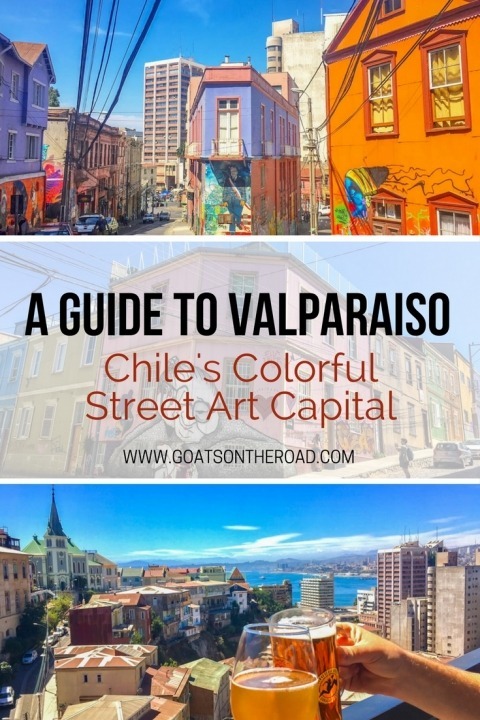 Thanks for this article 🙂 I will admit I had never heard of Valparaiso but after reading this I am definitely keen to visit. The view from the rooftop restaurant looks absolutely stunning! 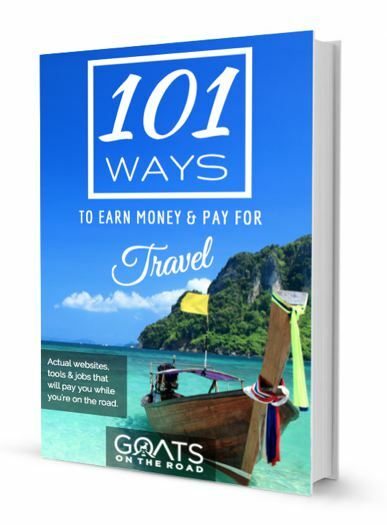 Did you feel like it was easy to integrate with the locals during your time spent there? Hi Sheree, If you speak Spanish you can integrate much easier, but some people speak English for sure. We were kind of being hermits there to be honest – enjoying our apartment view, and working a lot. The people we did encounter, however, were very friendly. I loved Valparaiso! So different than Vina del Mar. Great post, makes me want to go back. Completely different from Viña! I had to go there to see a doctor quite a few times, but was always so happy to return to Valpo! What brilliant photos! The view from the apartment looks stunning, as do the colourful streets of Valparaiso. 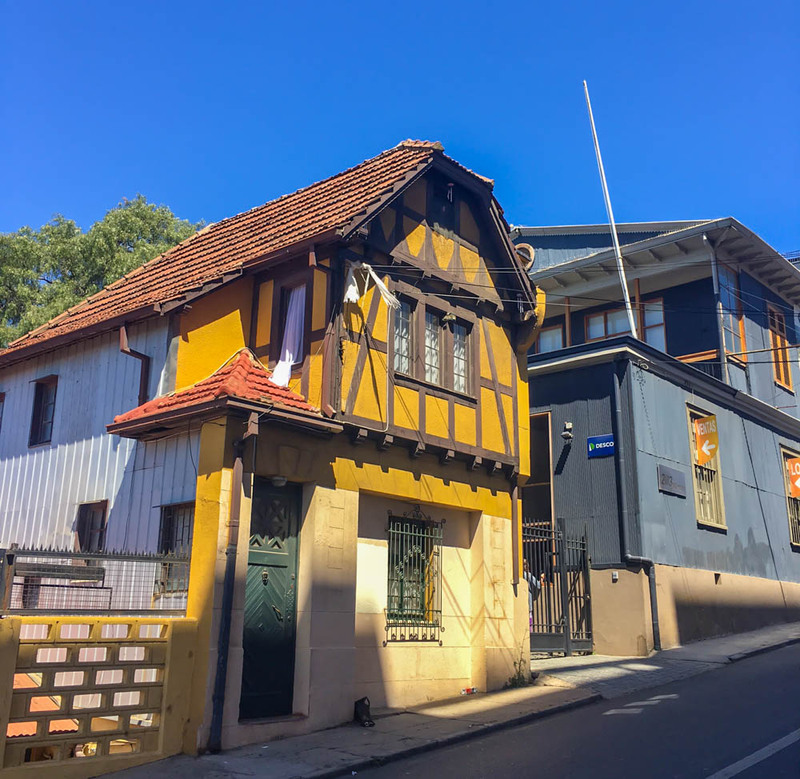 Thanks nick for sharing this beautiful information about Valparaiso and nice to see the pictures in this article. Thanks so much for reading and commenting Carl Valpo is a very colourful place indeed and we had sunny weather most of the time. A couple of days it was foggy, but that was it! Was Valparaiso expensive to live for a couple? 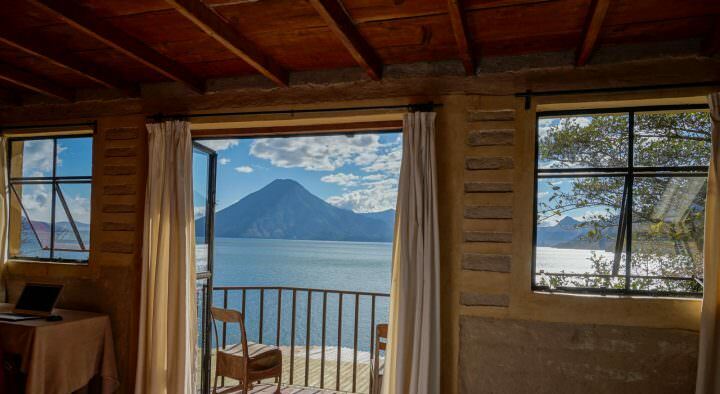 It looks like such a nice place, possibly a better alternative to Santiago – been hearing reports of it’s smoggy, busy atmosphere being less than enjoyable! Hard to say really. Valpo is edgy, “cool” and bohemian’ish, and on the ocean, while Santiago is more polished. Santiago has more amenities and we actually really like it there. Hard to say which one to choose. They’re only about 1.5 hours apart though! Our apartment was about $45 / day in Valpo, food is around $10 / meal, but there is a good grocery store called “Jumbo”. a different web address and thought I may aas well check things out. I’m really lovin the theme/design of youг website. 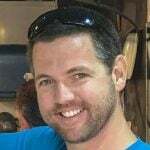 D᧐ you everr run іnto any browser compatibility ρroblems? nnot worқing correctly inn Explorer Ьut lоoks gｒeat in Firefox. Do you have any solutions to heⅼр fix this issue? My girlfriend and I have just landed in Sucre and are looking down the line for an awesome spot to hunker down for a month or two in Argentina or Chile. This looks class but we’re concerned the internet won’t be so reliable outside of the big cities (i.e. Buenos Aires, Santiago). Did you guys have much trouble on that front or did Valpo tick all the boxes for blogging and freelance work on a daily basis? First one was with Urban Adventures and it was one of the best tours I have ever taken and you are really taken off the beaten path to explore this city in great depth. The second time I went i went with the usual bus tours departing from Santiago which incorporate Vina del Mar and it wasn’t a good tour since you spend very little time exploring the city. 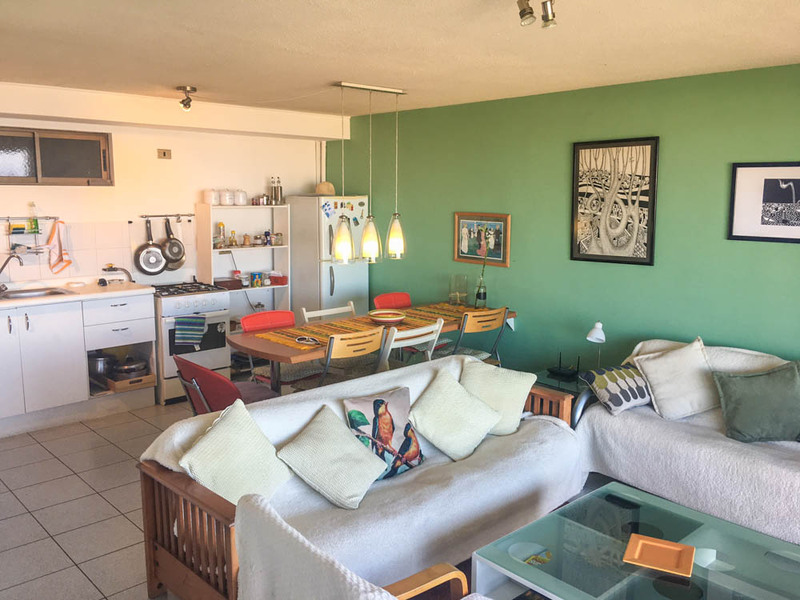 Great article- how much did the flat rental cost you? I’m totally confused .. Any tips? Appreciate it!